The controls in the top panel of LG's DLEX2501W may indicate to users the extent of its set of features. Moreover, with the 7.3 cubic feet large capacity of the machineís interior, youíd sure save on the number of times you will need to load the machine. Thereís also LGís trademark TrueSteam Technology, giving the user the option of steam drying items, something that a lot of dryer owners really use, as steam is something effective and delicate. The accompanying SteamFresh feature also ensures items dried by the machine donít get that strong hot smell that usually clothes get with other dryers. The 7.3 Stainless Steel Drum in the dryerís interior can definitely hold a lot of laundry loads. Not only that; the NeveRust technology in the drum, a trademark in LG machines, assures a long machine life as the interior will not be subject to corrosion or chipping. The ReduceStatic feature in the machine helps eliminate static electricity in normal loads with the introduction of steam during the every cycleís final five minutes. All items unloaded are soft and natural, not stiff and stale-smelling. With the EasyIron features, loads are evenly and lightly moistened before a cycle ends, so that subsequent ironing will be a breeze. Most striking control in this Upfront Electronic Control Panel is the LG-trademarked Dial-A-Cycle which allows users to choose the cycle to use by just a simple turn of a dial. The large Chrome Rimmed Door with Glass can have users have an unobstructed view of the machineís interior anytime. 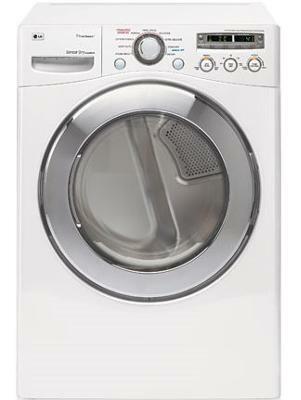 The dryer does not have a top door, so it is stackable with its matching washer, for economy in space. The white exterior gives the dryer a refreshing look, aside from making it easily adaptable with the look of any room it will be placed in. The 9 programs built-in in the dryer (SteamFresh, Heavy Duty, Cotton/Towels, Normal,Perm Press, Delicates, Ultra Delicates, Manual Dry, Speed Dry, Air Dry) give the user a broad range of options when it comes to choosing which cycle would be most appropriate for the load to be dried. The dryer is chockfull of features assuring the optimal care of items to be dried. For example, fabric care features like precise temperature control assure users that no items will get damaged or will receive too much heat. For a dryer as advanced and feature-filled as this model, users who would like to own this model would need to dole out extra, as it is priced higher than the average dryers in the market.